For those of you haven’t yet experienced Ibiza, you may have pre-conceived ideas of this beautiful Mediterranean island. Lying off the east coast of Spain, the third largest island in the Balearics is still shaking off a lingering reputation of hedonistic partying and electronic dance music left over from the 1990’s. But avoid Ibiza at your peril. “Ibiza has a special kind of magic” says Estela Estévez, CEO of Estela Exclusive Homes, Christie’s International Real Estate’s exclusive agent for Ibiza and Formentera. Having lived on the island for over 20 years, Estela has seen people come to Ibiza and never leave. “They fall in love with the place; the weather, the people and the easy-going nature attracts an international crowd who happily co-exist in island life. All you need to be in Ibiza is yourself”. From the unspoilt tranquillity found in the North of the island, the UNESCO World Heritage site that is Ibiza Town and the crystal-clear waters that rival the Caribbean, a stay in Ibiza ticks every box for those holiday makers in the know. White Ibiza is one of our key points of reference when we’re off to the magical White Isle. 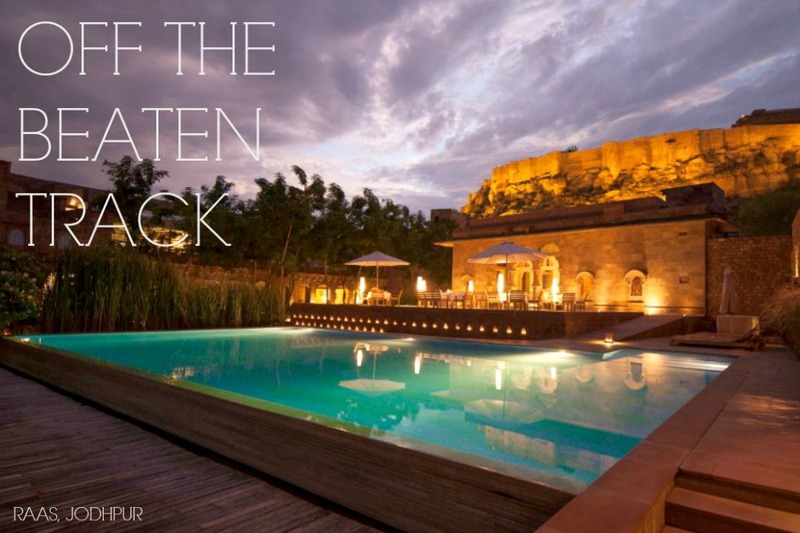 It offers their readers online exclusive content inspired by life on the Balearic Islands. 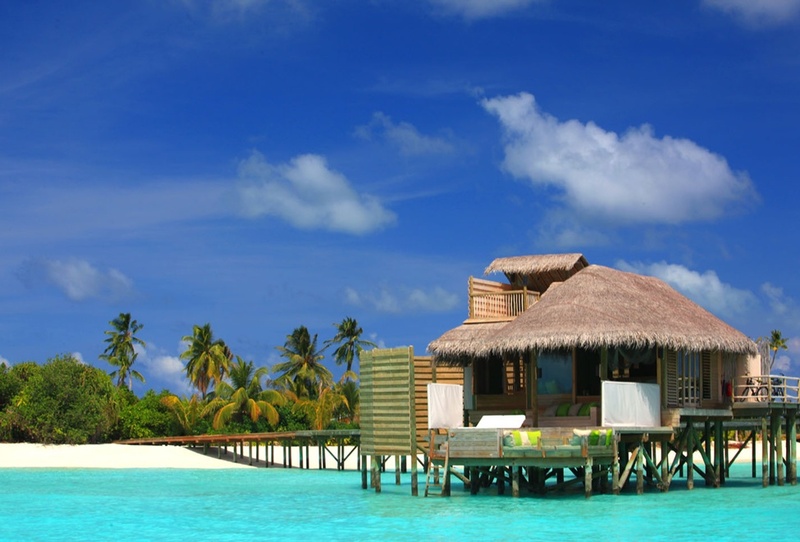 Luxury beach clubs, beautiful beaches and boutique hotels all feature, making it our island bible. With this knowledge comes lesser-known places. 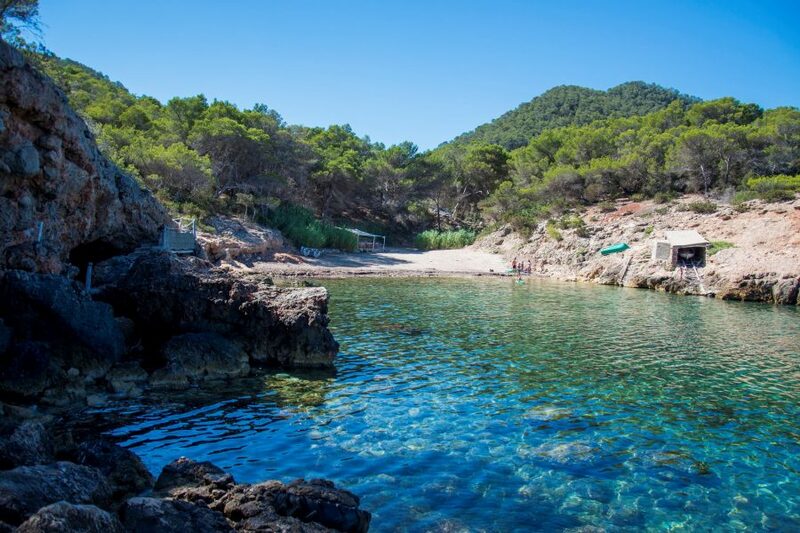 Cala Xuclar is “the best kept secret beach in Ibiza” according to Editor, Kristie Rogers. “The only reason I think people don’t find it is because they miss the tiny turn down to the horseshoe-shaped cove. With no mobile phone reception, it doesn’t get more rustic than this”. Found in the northwest of the island close to Portinatx, Cala Xuclar is only accessible by vehicle, patience and a good sense of direction. We couldn’t write an insider’s guide to Ibiza without including yoga. With its organic cafes and holistic living, Ibiza attracts those who are looking to reconnect with their bodies and minds. Many believe this is because of the mysterious rock Es Vedra which lies off the southwest coast of the island. Es Vedra’s high concentration of metals and minerals makes it the 3rd most magnetic place in the world. Making the energy pull to Ibiza not only emotional but based in science. Located in Ibiza’s Old Town, Sebastian Carincotte opened Hot Yoga Ibiza to “encourage students to listen to their own bodies, becoming their own gurus and seeking their own truths”. The perfect antidote to the party lifestyle. Driving down the long dusty track to Experimental Beach, you’d be forgiven for thinking you might have made a wrong turn. Tucked away behind the Salinas salt flats and only accessible by car, the lack of signage has helped maintain Experimental Beach’s air of exclusivity. 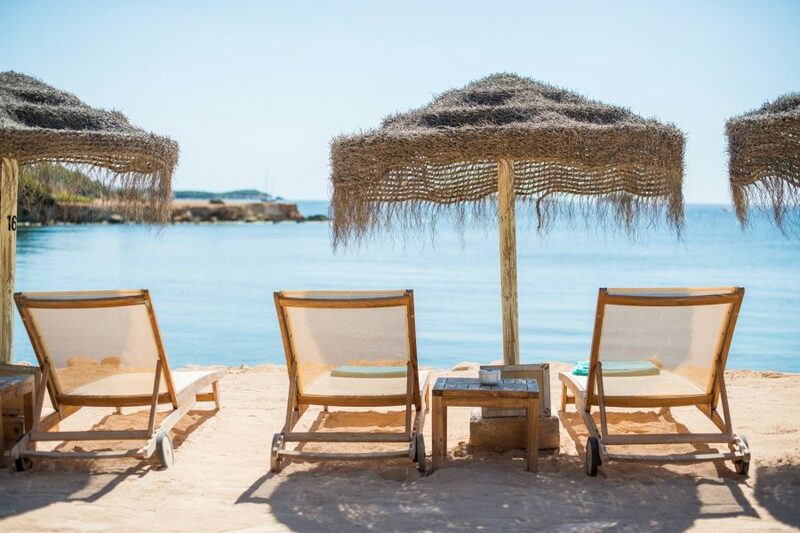 Since its opening in 2013 this laid-back beach club remains a secret hangout for the Ibizan regulars. 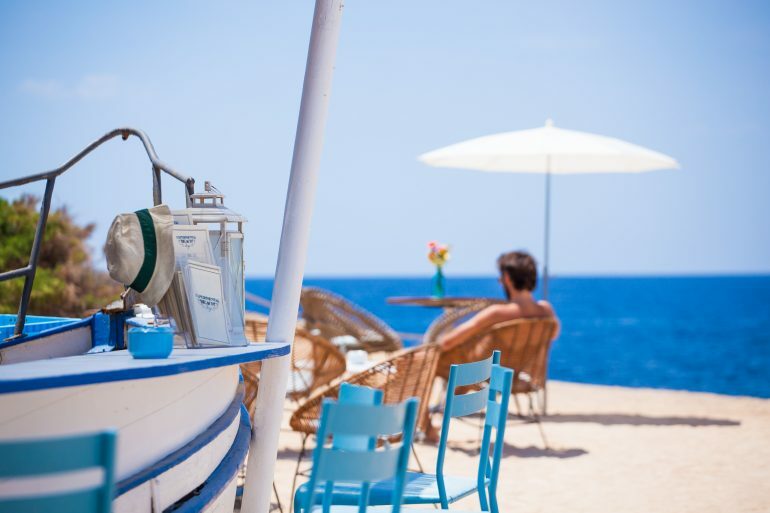 The ice blue daybeds reflect the Mediterranean Sea in the background to perfection or you can enjoy a cocktail or three at their ‘Boat Bar’ which has been fashioned out of a white-washed sailboat. Boasting one of the best sunsets on the island, we recommend you take advantage of their French-inspired menu and Whispering Angel rosé from the comfort of their sunbeds by day, to then watch the sun go down as the resident DJ’s spin their tunes late into the night. 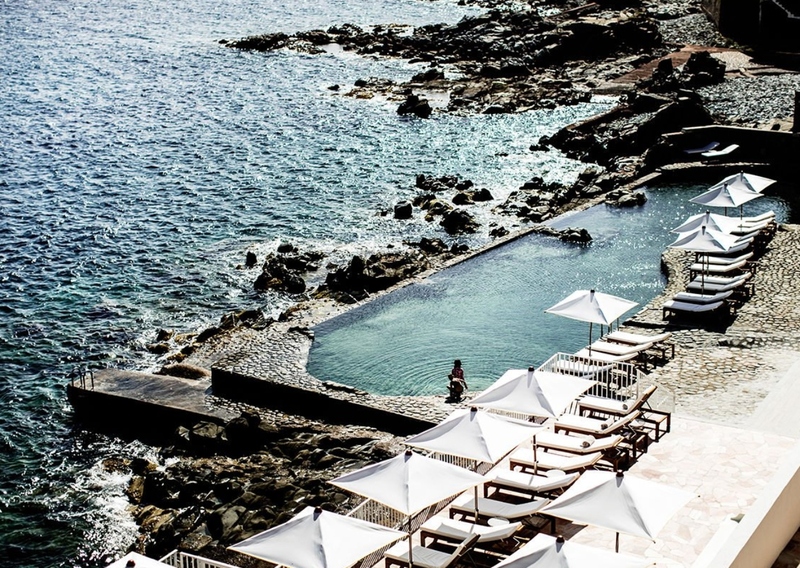 This 150-year-old finca houses one of the most exclusive hotels on the island. Hidden away in the tranquil North, The Giri Residence is located in the lesser known area of San Juan. It attracts those who want the ultimate seclusion without scrimpingo on luxury, with just five sumptuous suites in the whole hotel. Adding to the sense of luxury is The Giri Spa which you won’t find advertised in any magazine or on any billboard. 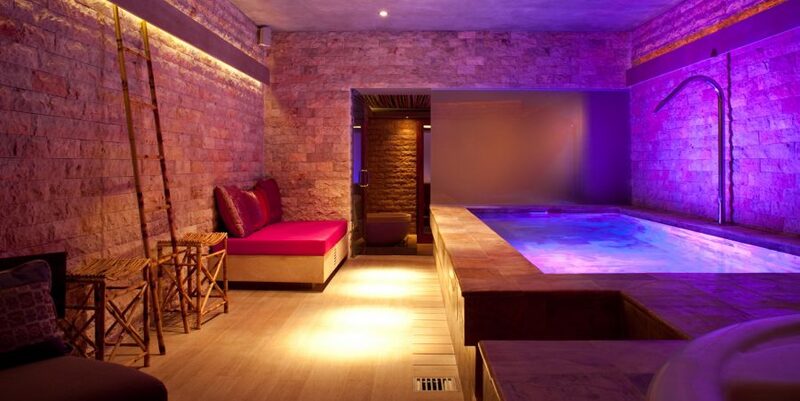 Open to non-residents, this incredible underground spa can also be hired for you and your other half on an exclusive basis to soothe away tensions with an Ayurvedic couples massage or taking a dip in the heated plunge pool. If you’ve ever wondered where Kate Moss and Naomi Campbell spend their summers, then look no further. This secret lunch spot is a short boat ride away on the tiny island of Formentera making it the perfect retreat to hide from paparazzi. Located on the southern tip of Migjorn, the inaccessibility of 10 Punto 7 helps with one’s anonymity. 10.7 happens to be the navigation coordinates from Formentera’s main beach so you either need a solid understanding of your satellite navigation system or you need to arrive by luxury yacht charter. Italian-born Vittorio and his family opened this stylish oasis in 2006. 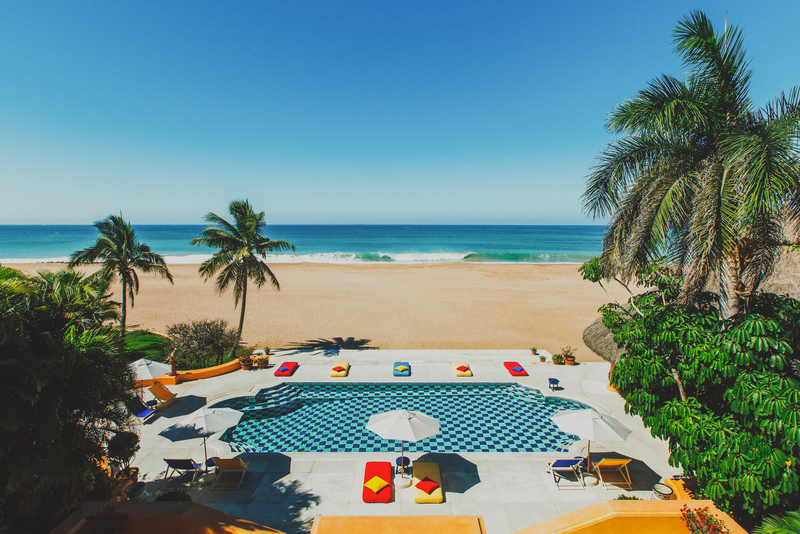 Now regularly named one of the best beach clubs in the world, we’re almost reluctant to share this address with you. How does one pull the bohemian look that encompasses Ibizan style? By shopping at Vicente Ganesha in Ibiza town, that’s how. Serena Cook of Deliciously Sorted tells us that “this is where the New York stylists flock when on the island. Known for their unique, colourful pieces, you can expect to run into Armani shopping for inspiration for their next collection”. Fashion legend owner Vicente Hernández sits outside with his trademark beard selling the finest antique jewellery and crochet designs to fashionistas. And be sure to pick up one of his handmade leather handbags to truly fit in with the local bronzed beauties. 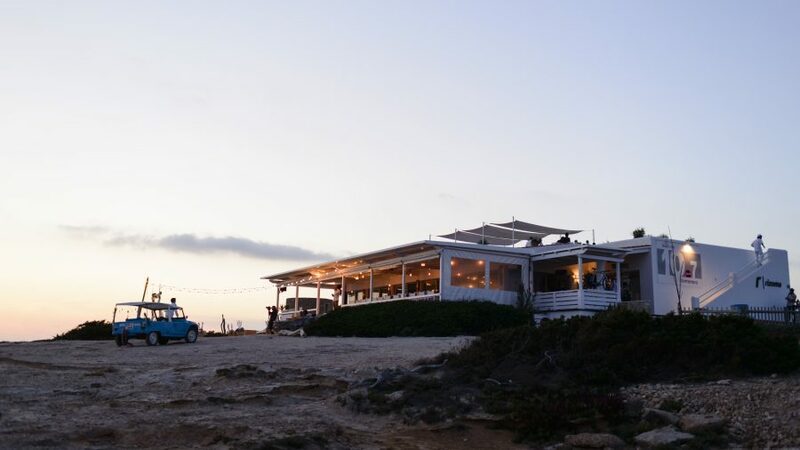 If you’re speaking to those friends who know Ibiza inside out, chances are they’ll recommend El Chiringuito in Salinas. El Chiringuito has held the heart of many an Ibizan regular who enjoy long, rose-soaked lunches and endless sea views. But we can recommend another hot contendor. Babylon Beach combines beach bar, restaurant and organic farm. 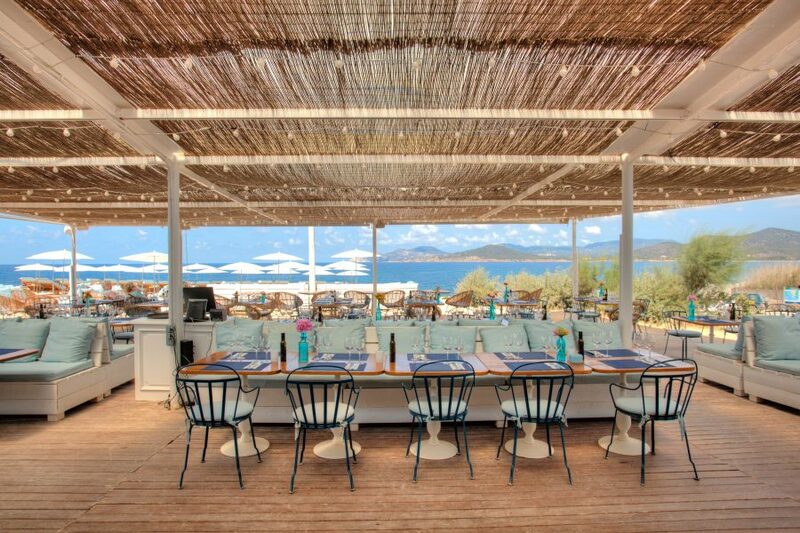 Located in Santa Eulalia, this laid-back chiringuito “puts more love into a dish than anywhere else” says White Ibiza. “From marinade to artisan bread, absolutely everything is lovingly crafted by hand making the quality exceptional”. You might have difficulty tracking it down but try you must. It will be your favourite in no time. You know it’s exclusive when it doesn’t even have an address. 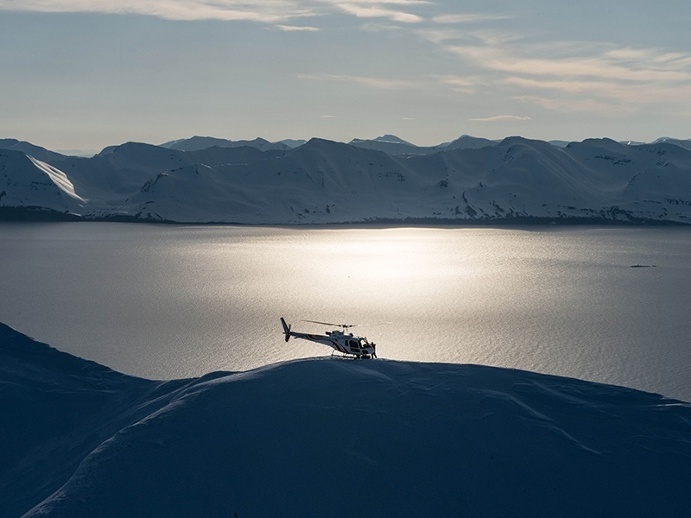 If you’re ever lucky enough to receive an invitation to The Kave, we’d suggest you accept. Run by the ‘legend’ that is George, The Kave hosts the coolest parties in the north of the island. Serena says “although parties at the Kave are ultra-exclusive, they’re not all about celebrity. You might bump into Kate Moss or Mario Testino but this is old school Ibiza at its best”. Delivering the best music from world-renowned DJ Solomun amongst others, these invitation-only parties are legendary for all the right reasons. 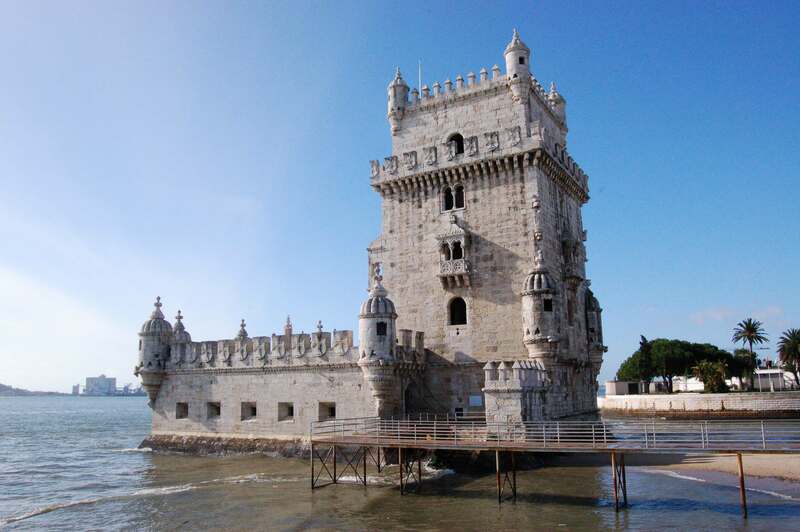 Suzy Small is Director of Mensos Concierge who specialises in creating bespoke, luxury travel experiences. To book your trip to Ibiza, please contact us by using our online form. Alternatively you can call us on +44 (0) 208 838 3510.